One of the preconditions for a cell to survive and to grow is to attach and to spread on a substrate. Using their actomyosin machinery cells generate internal tension that contracts the cell body [1,2] and thus exert tractions on the underlying substrate through focal adhesions which physically connect the actin cytoskeleton to the ECM . This traction force is crucial for cell shape maintenance, migration, mechanotransduction and many cellular functions. Traction force plays a important role in a lot of biological processes, such as inflammation, metastasis, wound healing, embryogenesis and angiogenesis. Therefore measuring the cell traction force is essential for understanding these underlying biological processes . A very popular method to study these cell-substrate mechanical interactions, is with the use of polyacrylaminde hydrogels combined with fluorescent mirobeads as markers for determining the strain due to tractions forces  as originally described for use with silicone rubber sheets . These gels are easy to employ [7,8] and have very good mechanical properties. Over a wide range of stress these gels produce a linear deformation and recover completely when stress is removed. By varying the concentration of bis-acrylamide the stiffness of the gel can easily be manipulated. The figure on the left shows the principle of the traction force microscopy. In order to measure the contractile forces cells are seeded on an elasic PAA gel which is exactly determined in its mechanical properties and contains embedded beads on the surface. These beads serve as markers to visualize any deformation of the gel. When these cells start to spread they contract and thus deform the underlying substrate. Gel deformations are estimated using a Fourier-based difference-with-interpolation image analysis . To characterize the contractile forces of each cell, the elastic strain energy stored in the polyacrylamide gel due to cell tractions is calculated as the product of local tractions and deformations, integrated over the spreading area of the cells . Figure 1| (A) Spreaded cell before detachment using trypsin which digests its atheasion proteins. Due to its prestessed cytoskeleton the cell colapses and releases to strain energy stored in the gel. (B) Gel deformation caused by the cell visualised in the flourescent microscop channel. (C) Strain energy heatmap of the cell. Bright field and traction field images are overlaid to show the position of the cell. In our lab we produce our Poly-acrylamide gels directly in 35mm petri dishes. With this method many gels can be produced at once making measurement as well as storage very easy and steril. In order to use the PAA gels without a confocal microscop, all fluorescent beads in the gel have to be in one single focal plane. Therefor the gels have to be centrifuged during polymerisation process to bring all beads to the surface of the gel. Figure 2| Traction dish fabrication. 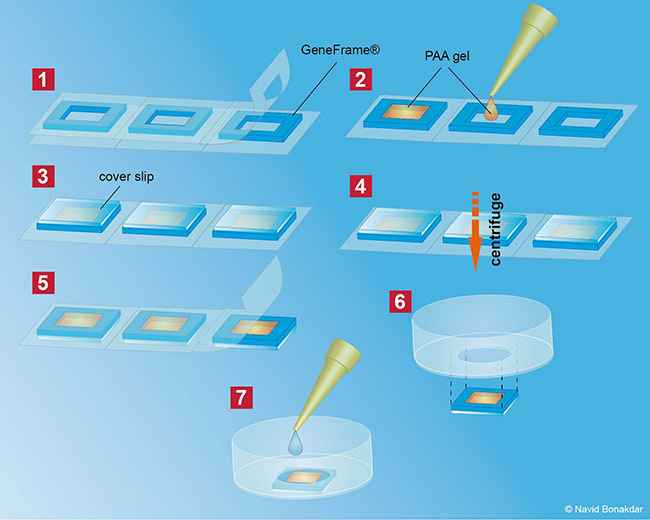 (1) Thermo Scientific Gene Frame seals with a capacity of 25µl serve to frame the gel. The upper frame is removed. (2) 28µl of the Polyacrylamide solution containig fluorescent beads is added in each chamber. (3) Silaniced cover slips are than putted on top of each Gene Frame. (4) In order to get the beads to the surface of the gel, the frames have to be centrifuged during the polymerisation process. (5) After polymeriasion the second foil is removed. (6) Cover slip containig the gel is pressed to the bottom of a drilled 35mm petri dish. (7) Gels are washed a few times with HEPES buffer and are then stored in PBS. After the gels are fabricated, the surface of the gels is activated with sulfo-SANPAH (Pierce Biotechnology, Rockford, IL) and coated with with an extra cellular matrix protein e.g. fibronectin. Cells are then seeded on top of the coated polyacrylamide gels and are cultured for 1h-24h to let them completely adhere. Cell tractions are computed from an unconstrained deconvolution of the gel surface displacement field measured before and after cell detachment with 8 mM Cytochalasin D and Trypsin/EDTA (0.25/0.02%) in PBS . During the measurements, the cells are maintained at 37°C in humidified atmosphere containing 5% CO2 . Kolega, J., L. W. Janson, and D. L. Taylor . 1991 . The role of solationcontraction coupling in regulating stress fiber dynamics in non-muscle cells. J. Cell Biol. 114:993-1003. Sanger, J.W., Sanger, J.M., and Jockusch, B.M. (1983). Differences in the stress fibers between fibroblasts and epithelial cells. J. Cell Biol. 96, 961–969. Balaban, N. Q., Schwarz, U. S., Riveline, D., Goichberg, P., Tzur, G., Sabanay, I., Mahalu, D., Safran, S., Bershadsky, A., Addadi, L. et al. (2001). Force and focal adhesion assembly: a close relationship studied using elastic micropatterned substrates. Nat. Cell Biol. 3, 466-472. Wang JH,Lin JS. Cell traction force and measurement methods. Biomech Model Mechanobiol, 2007;6:361-371. Beningo KA, Lo CM, Wang YL. 2002. Flexible polyacrylamide substrata for the analysis of mechanical interactions at cell-substratum adhesions. Methods Cell Biol. 69:325-39. Pelham RJ Jr, Wang Y. 1997. Cell locomotion and focal adhesions are regulated by substrate flexibility. PNAS. 94(25):13661-5. Wang, Y. L., and Pelham, R. J., Jr. (1998). Preparation of a flexible, porous polyacrylamide substrate for mechanical studies of cultured cells. Methods Enzymol. 298, 489–496.